Following Selena’s first collaboration, which introduced the Selena Grace bag and accessories in Fall 2017, the new Coach x Selena Gomez Fall 2018 collection includes her first ready-to-wear pieces and is designed by the star in collaboration with Coach Creative Director Stuart Vevers. Featuring ready-to-wear, bags, small leather goods and accessories, the collection is imbued with Selena’s powerfully feminine spirit. Pieces styled by Selena feature her unique touches, including an empowering personal motto written in her handwriting—“Not perfect, Always me”—and a bunny motif that speaks to her imagination. The collection is designed to perfectly reflect Selena’s playful sense of style, which contrasts pretty with sporty and elegance with cool. 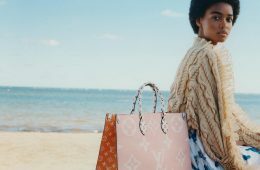 In addition to ready-to-wear, which includes pretty silk slips finished with lace and ultra-soft sweaters and hoodies in retro-inspired pastels, the collection also introduces two new bag silhouettes—the Bond and the Trail Bag—which Selena designed in close collaboration with Vevers. Crafted in smooth leather and finished with antique-inspired crystals and bows, the bags bring a fresh lens to Coach’s legacy of leathercraft. The Coach x Selena Gomez collection will be available for pre-order online at Coach.com on August 14. Inspired by her own personal style that is both feminine and unapologetic, Selena Gomez discusses the theme of her exclusive new Coach collection with creative director Stuart Vevers.